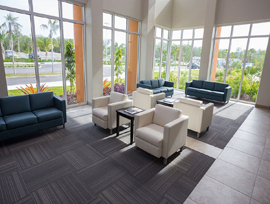 Apart from the exterior of your building, your waiting area will be the first impression new patients get of your practice, your staff, and your overall brand. Yet, updating a waiting room is often an afterthought. If your waiting room has become tired and out-of-date, here are a few ideas to give it a makeover. When a patient walks into a dental office and approaches a reception area with faded floral wallpaper, outdated countertops, and clutter, they’ll check in and sit down with real concerns about the care they’re about to receive. 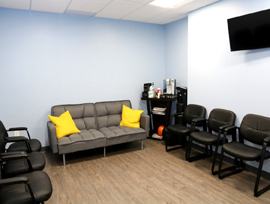 An antiquated reception area suggests that the clinic itself isn’t up-to-date with its techniques and equipment. 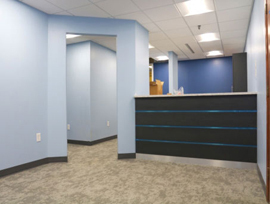 To remedy this, a remodeled reception area will give a facelift to a very visible part of your dental practice’s waiting area. 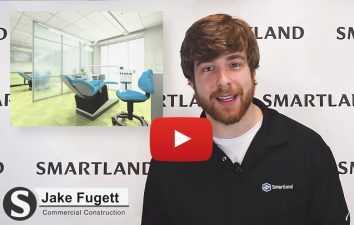 This might include decorative wood paneling that features the name of your practice, new countertops, as well as a new design-build dental reception desk that’s customized for your staff’s needs. It’ll look great and help the office aspect of your practice flow much more smoothly. Waiting for any appointment isn’t fun, but for many patients, waiting for a dentist appointment is especially uncomfortable. This problem is only amplified when they’re greeted by rows of hard, sterile chairs. When you remodel your dental waiting area, it’s important to update it with furniture that not only looks great but is somewhere you’d like to spend time waiting. Don’t limit yourself to individual chairs, either. The addition of a small sofa or two will give your waiting area a relaxed, more homey feel. In addition to welcoming your patients into your waiting area with comfy new furniture, think outside of the box when it comes to its layout. Rows of chairs are very outdated. If space permits, consider arranging furniture into separate areas to accommodate patients with different needs. For example, it’s an excellent idea to set aside an area as a kids’ corner with kid-sized furniture, toys, and books. You may also consider providing workstations or a common work area for patients who are missing work to take care of a dental appointment. Seating arranged around a table with newspapers and magazines can provide a dedicated reading area. A television area is another excellent idea, whether the TV is tuned to the news or a movie or is used to display educational dental videos. As part of your waiting room update, consider adding a small retail area for customers to browse while they wait. While this may sound like an unusual idea for a dentist’s office, many modern offices are starting to incorporate retail into their customer experience. It provides an excellent opportunity for you to give customers easy access to items you frequently recommend during appointments. What items should you sell? Make sure to only choose high-quality products that you really believe in. You might choose toothpaste, electric toothbrushes, or specialized dental flossers. For high-dollar items, only stock a few at a time so it doesn’t hugely impact your bottom line if customers aren’t interested. You can always expand or cut specific items according to sales and customer feedback. 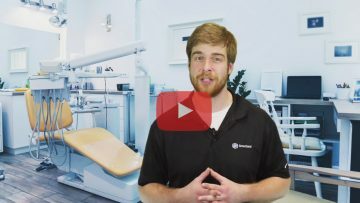 Finally, make your dental practice a place that customers are excited to visit. Free WiFi should be a standard amenity in any waiting area nowadays, but up the ante by providing iPads to use (tethered to the furniture so no one accidentally leaves with one). Other additions that will entertain your patients and put them at ease while they wait? Build in a complimentary coffee/snack station to make your guests feel truly valued. Adding toothbrushes, mouthwash, and floss to your restrooms can also give patients a chance to clean up a little bit providing a better experience for both you and the patient. If you have space, go all-out and install an electric massage chair for patients to take turns pampering themselves before they step into the dentist’s chair. Updating your waiting area is about first impressions and perception of your overall brand, but most of all, it’s about keeping your customers happy. When you put yourself in their shoes, it’s easy to visualize a stylish new waiting area that will make them feel welcomed and put them at ease.